You can join and support Oakhurst Pétanque Club easily. Just fill in the form below which will be e-mailed directly to us. We will then send you an application. Membership is currently $25/Person for individual memberships, and $15 for Juniors (under 17). Memberships are "calendar year" and renewals are due no later than each January 1 for the following year. 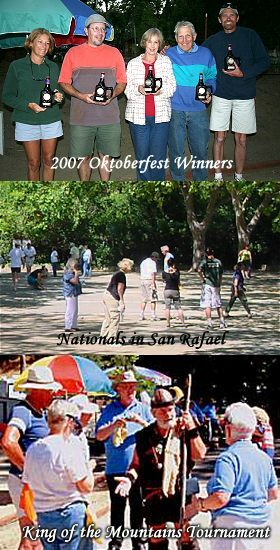 As a member of Oakhurst Pétanque Club you receive, via e-mail, our monthly color newsletter, "The Occasional Boule Sheet", a membership card in Federation Pétanque USA, the FPUSA newsletter (several times a year), and a portion of each club membership ($15/person) goes to support the U.S. competition programs of Federation of Petanque USA. As an OPC and FPUSA member you may compete in any FPUSA sanctioned events for which you qualify, meaning that as a member of Oakhurst Pétanque Club, you can go all the way to the world championships - if you practice enough! There is only one membership requirement in playing petanque: as with participation in all organized sports in the U.S., new members must sign a sports waiver and release to comply with legal requirements of liability insurors. FPUSA must keep these waivers on file as a requirement of belonging to the national association, Federation of Petanque USA, and club site property owners. Oakhurst Petanque is one of the largest clubs in the Oakhurst-Sierra Mountain Area and its members range from "youngish marrieds" and singles" to retired couples and individuals. Our goal is to combine sociality and gamesmanship so we are as known for our potlucks and picnics as we are as competitors and players in local, regional and national events. You will have the opportunity to visit spectacular petanque clubs, to play in FPUSA-sanctioned events, and you can take part as Oakhurst Petanque Club hosts some of these events, as well. If you are a former golfer, bowler, or you've participated in any sport or activity requiring good hand-eye coordination, or if you want to improve your hand-eye skills, Petanque is the game for you! Learning how to play the game is easy, and yet you can challenge yourself as much as you wish since the finer points of the game can take many years of practice to learn. Either way, you're always welcome to join Oakhurst Petanque Club and experience one of the world's oldest games, the mountain area's friendliest people, and wonderful, healthful, outdoor activities on a regular basis.